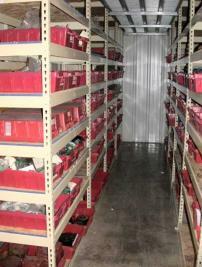 Smaller valve assemblies, stock parts and work in progress were stored in plastic tote bins. 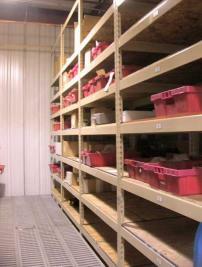 The large number of bins in use (almost 500) required a two level system to achieve the desired storage capacity in the footprint area allocated for bins. The system was assembled by Nooney employees with Boltless Speedi-Bilt Rivet Racks provided by Preferred Equipment. The mezzanine walkway on the upper level uses open plank grating to allow light and ventilation to flow to the area under the walkways. 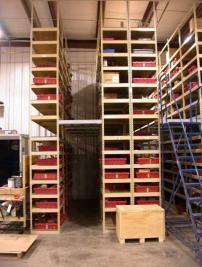 The rack system was custom designed to fit Nooney's existing tote boxes and to maximize the storage in the bin area. 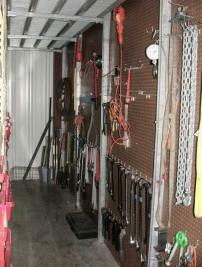 An open wall on one side of the storage mezzanine was used to hang custom tools, lighting and lifting equipment.